PSA must move fast in China if it wants to challenge leaders such as VW and GM. 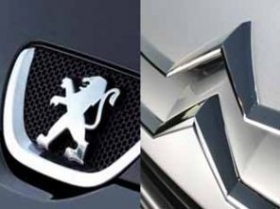 SHANGHAI (Reuters) -- PSA/Peugeot Citroen SA aims to start building its third China plant with partner Dongfeng Motor Group Co. by the end of this year, two sources said on Wednesday, as the French automaker moves to more than double its share in the world's largest auto market. PSA, which already operates two facilities in China with Dongfeng, wants to sell up to 400,000 cars in the country this year, approaching its annual capacity of 450,000 units. "The two partners want to build the new plant within the year and are working out the details now," a source with direct knowledge of the matter told Reuters. The plant, with annual capacity of between 150,000 to 200,000 units, is scheduled to be up and running by 2012, said the source. Site of the greenfield plant and product mix have yet to be finalized but the central city of Wuhan, where the two existing plants are based, is among the options, said another source familiar with the matter. "Dongfeng and PSA are still selecting sites now. Things will be firmed up in the next few months," the source added. PSA declined to comment and Dongfeng executives could not be immediately reached. China, which eclipsed the United States as the world's top auto market last year, has been a major bright spot amid a global industry downturn and a safe heaven for foreign auto giants. General Motors Co., which already makes cars and light commercial vehicles with China's major auto groups SAIC Motor Corp. and FAW Group, is now selecting a site for a greenfield China plant, executives had said. Rival Volkswagen AG also pledged last month to add an additional 1.6 billion euro ($2.02 billion) to its previously announced 4.4 billion euro China investment scheme. PSA, whose 2010 auto sales target is merely half what GM had sold in the past four months, is also speeding up its expansion in the market, along with Ford Motor Co., Toyota Motor Corp. and Nissan Motor Co. among others. Earlier in the month, PSA reached an initial agreement to set up a 50-50 venture with the parent of Chongqing Changan Automobile Co. to make light commercial vehicles and passenger cars. "PSA has been a relatively conservative player in China compared with GM and others. There seems to be an adjustment in its strategy now," said Chen Liang, an analyst with Huatai Securities. "It's a good move as no one can afford to be missing out on the China market."